Home » ‘Mars Henge’? 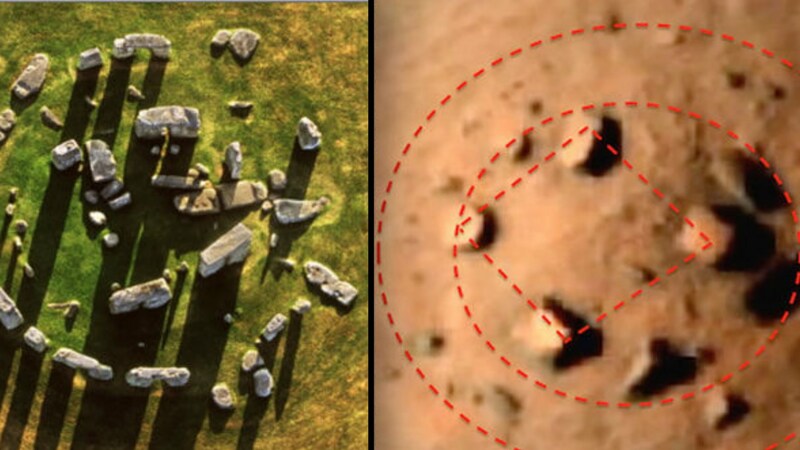 Is mysterious stone circle found on Red Planet clearest indication yet of alien civilisation? If Stonehenge is a symbol of an ancient civilisation here on Earth , then does ‘Mars Henge’ represent the same thing on an alien world? The latest in a line of potential discoveries on the Red Planet , alien hunters have come across a mysterious pattern of rocks on the surface. “This is something remarkable,” said Scott C Waring from UFO Sightings Daily. The pictures were found from a cache of images taken of Mars from a NASA probe in the 1970s. Videos of Mars Henge have already been posted to YouTube and have been gaining views. NASA currently has a rover on the Martian surface and eagle-eyed ET hunters have seen several interesting things on the planet . But experts have explained it away as a case of pareidolia – where people’s brains trick them into seeing familiar patterns in naturally occurring objects.